Over the years, we’ve climbed with thousands of people and introduced many more to the magic of recreational tree climbing. For many people, our two-hour Goodleaf tree climbing experience is a great introduction to tree climbing. For others, who would like to explore the immersive joy of recreational tree climbing, we offer a 3 day Essential Recreational Tree Climbing Course in conjunction with Lantra Awards. We believe that experiencing adventure outdoors is essential to every person’s well-being. We know that nothing beats the thrill and back-to-nature experience of tree climbing for fun. With our three-day course, you can learn how to climb trees independently using a rope and harness. Anyone who wants to learn how to climb large trees for purely recreational enjoyment. Recreational tree climbing uses a rope and harness to access the canopy of mature trees. People from all kinds of backgrounds and with all kinds of experience levels sign up for our three day course, including woodland owners, birders, outdoor adventurers, geo-cachers and others who love unusual, physical and challenging pursuits. It’s a hands on, intensive, practical course where you’ll be led through the essentials of accessing a tree using a rope and harness. The course will teach you to access tall trees safely, enable you to move around in the canopy and descend in a controlled manner. The emphasis throughout the course is on safety whilst tree climbing. We teach using a DdRT system. You’ll spend three days learning how to climb trees under Paul’s expert instruction. It’s a beautiful way to take a break from normal life, with almost the whole course taking place outside in Appley Park, Ryde, Isle of Wight. 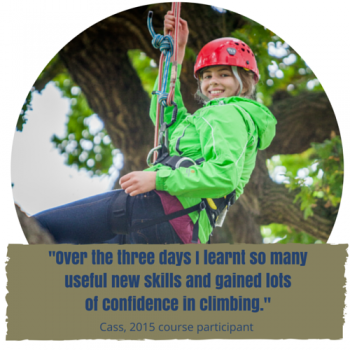 You’ll leave the course feeling renewed and confident about your tree climbing knowledge. Included in the course are: equipment use, pre-course materials, tree climbing tuition, take-away climbing manuals and all the tea and Tree Climbers flapjack you can consume. After passing the assessment at the end of the three days, you’ll leave the course with a Certificate in Recreational Tree Climbing, awarded by Lantra Awards and Goodleaf. It’s £325 for three days (that’s three full days from 9am to 5pm). If you book for two or more people together you’ll receive a 10% discount. Don’t forget we have gift vouchers available. Please do contact us if you can’t make these dates. We’re happy to put the course on at other times throughout the year on demand (subject to availability).